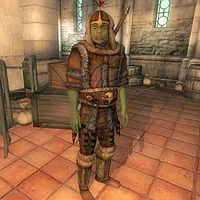 Uzul gro-Grulam is an Orc warrior currently living with Myvryna Arano in one of the shacks in the Imperial City's Waterfront District. While he expresses a desire to marry Myvryna, it seems his eye tends to wander a bit back to his own kind, as he believes Umog gra-Marad, wife of Graman gro-Marad, to be the perfect woman. He gets out of bed every morning at 6am and always starts the day with three hours of wandering around in the shack while talking with Myvryna. At 9am, he heads up to the dockside and enters his workplace, the Imperial Trading Company warehouse. He keeps working until 6pm, only interrupted at noon, when he heads home and enjoys a two-hour lunch. On all normal weekdays (Morndas to Fredas) he eats dinner at The Bloated Float Inn between 6pm and 8pm. He finishes the day with two hours of relaxation in the shack before he finally goes to bed at 10pm. On Loredas and Sundas, he skips his dinner at the Bloated Float and heads directly home at 6pm. Additionally, at 10am on Sundas, he leaves the warehouse and enters the Temple District for a four-hour prayer in the Temple of the One, which also causes him to miss lunch. The exception to this routine is during the Misdirection quest, when all Waterfront District residents are confined to their homes. He owns a set of common lower-class attire, a shirt with suspenders, breeches and clogs, which he uses for the majority of the day. He also owns an almost complete set of fur armor, including boots, helmet, greaves and cuirass, which he wears during his meals. His weapon of choice is a steel battle axe and he carries around the key to the shack and a small amount of gold. When you meet him for the first time, he will introduce himself and his plans – seemingly unaware about Myvrana’s relationships with both the Thieves Guild and Hieronymus Lex: "Uzul gro-Grulam. I'm courting Myvryna Arano, so stay away from her. I got matrimony on my mind." When asked about the Imperial City, he will reveal just how irresolute he is: "Hard to find an Orc girl in this city like Umog gra-Marad. Smart, tough, got a good trade. Nice-looking, too. So I got to make my intentions clear."